Looking at performance data charts you can see MP Rotator vs. a Spray Nozzle at 40psi. Even with three times longer run time you are still using about 30% less water. If you need additional help determining your run time, Hunter offers a Run Time Calculator. The calculator is a website that generates a peak-season run time schedule for each program and station in your system. 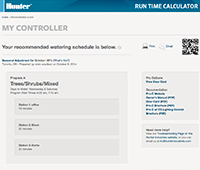 The calculator factors in historical ET (evapotranspiration) data for your region and your irrigation system setup to determine the schedule. It is important to remember the generated run time schedule is based upon your area's hottest month. You will need to adjust water usage as temperatures cool and heat up. You can either do this manually, through your seasonal adjustment feature on your controller (select models only) or through a weather sensor, such as the Solar Sync.